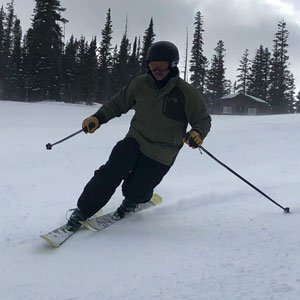 I have been alpine skiing since 1964 and tele-skiing since 2004. Skiing is a significant part of my life. I have historically struggled with weight and strength issues, which has affected my level of skiing as I have grown older. My story with Wright Training begins with spine surgery (laminectomy) in April 2017. I had physical therapy with Excel Physical Therapy at the Wright Training facility. During this time, I was also doing therapy for knee surgery (ACL replacement) I had done in 2011 that had never fully recovered. During physical therapy I observed people training with Wright Training coaches. I inquired about the programs offered (I had never participated in physical training before), discussing with my physical therapist and Coach Crystal. Physical therapy had brought some strength back after spine surgery, however, I decided to do “more” for the upcoming ski season. I signed up for the 3-month Ski Fitness Training, two times per week, with Wright Training, not really knowing what to expect. My main goal was to have more energy to ski at the highest level I am capable of. I really enjoyed ski fitness, Wright Training coaches provided a diverse, low key, and fun training program. My first day on the slopes was incredible, I had never felt this level of strength and confidence. With this new-found enthusiasm, I decided to continue and signed up for Wright Training’s 3-month maintenance program, two sessions per week. This program focuses more on strengthening, however, does have a good cardio component, very well balanced. The Wright Training coaches are experienced, they tailor workout programs to my personal restrictions, and create a fun atmosphere. They do push us to achieve our highest potential but do so in a structured and monitored approach. My experience with Wright Training has made me a “believer”, I never knew I could achieve this level of fitness and have fun doing it. I have experienced weight loss, my general attitude is greatly improved, and after each workout, my mind is clear. I am signing up for the next maintenance class in March, thinking I will never stop!